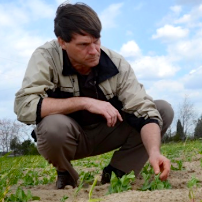 Deer thrive in NJ but we can’t lay blame at the feet of local farms. Deer are unlike other species whose numbers dwindle in the face of urban sprawl. Landscape modifications carving up habitat – the edges of neighborhood yards, for example – actually support more deer at higher densities per square mile than undisturbed forests. Due to modern NJ settlement patterns, available deer habitat has increased while predation has decreased leading to populations that have outstripped deer carrying capacity for much of our state. When deer populations overwhelm an area, normal deer behaviors bring them into closer contact with humans, resulting in increased incidence of human disease (for example, Lyme disease), auto vs. deer accidents, and competition for suburban landscaping and agricultural crops. 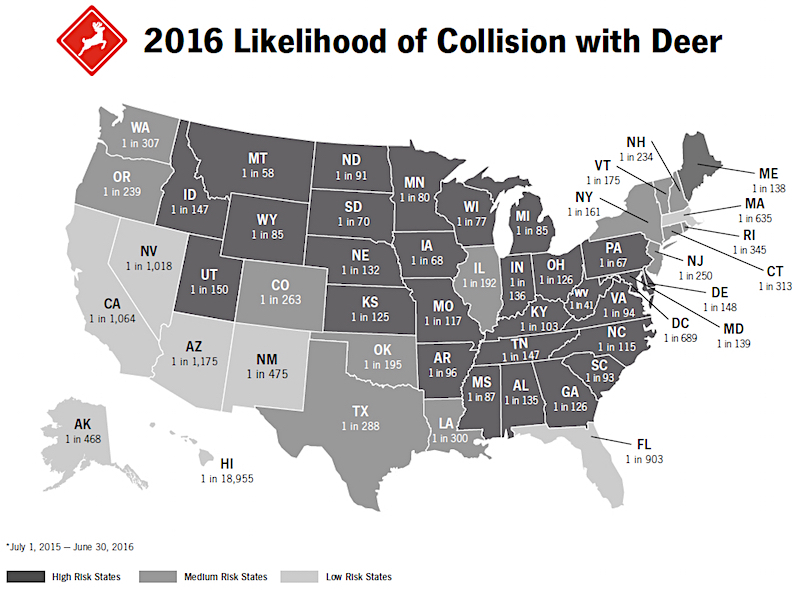 Likelihood of Collision with Deer 2016. Note New Jersey Risk: 1 in 250. Image: State Farm Insurance. Ecologists have determined that in the era before the arrival of colonial settlers, typical NJ habitats could support about 15 to 21 deer per square mile. Today, NJ’s urban sprawl areas are found to support 60, 80, and even 100 or more deer per square mile. 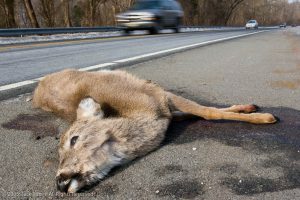 Studies show deer populations greater than 25 per square mile cause intolerable economic harm to farmers’ livelihoods. Hunter satisfaction surveys show that at about 40 deer per square mile, hunters report satisfaction. What about the environment and habitat? At very high populations typical in NJ, deer over-browsing of forest floor understories damages forest ecology. At its core, the solution to the multiple problems caused by deer overpopulation is better herd management by decreasing access to food and increasing herd culling. New Jersey Farm Bureau and the farm community are once again taking leadership roles in documentation, evaluating current controls, and making recommendations for immediate action by the state Division of Fish and Wildlife. The nature of how New Jersey continues developing has left farmers with no way to manage deer herds on their own. The abundant deer food supply found in our urban sprawl landscapes isn’t going away. Consistent effective efforts, especially in the areas of fencing and hunting, are needed to make an impact. Just like we fence highways to limit animal access to avoid accidents, fencing to limit access to our local farms food supply makes sense. As yet, not all high-value crop lands have been fenced. State fencing programs have been sporadic (not continuous since 2005, as erroneously stated in a nj.com story “Not now, deer: Farmers get money to fence out hungry visitors”). 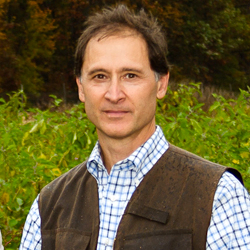 A state fencing program to protect farm products would stabilize losses incurred by farms and would contribute to local farm sustainability. No farmer is wealthy enough on their own to fight deer damage without contributions from non-farm landowners whose landscapes support ever increasing deer populations. Moreover, fencing program eligibility should not be limited to those enrolled in the farmland preservation program. Hunting is the most effective means of controlling deer populations. NJ Fish and Wildlife has liberalized recreational hunting regulations but this hasn’t been enough to stem the growing deer population. Public and private landowners near farms need to open their lands for hunting. “Hunting drives” and other organized culling efforts need to be back on the table as part of a plan to shrink deer herds. The number of hunters, like farmers, are decreasing. There is, however, interest in locally sourced food, including meat. Consider encouraging hunter mentoring programs to capture those individuals interested in participating in harvesting their own meat.